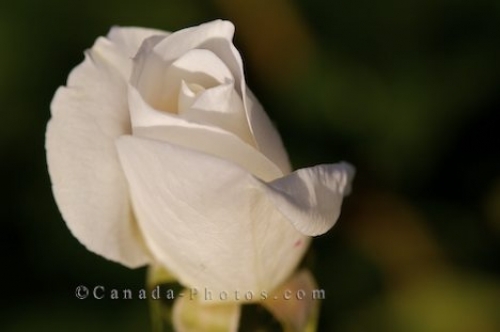 A photo of a budding white rose on display in the Rose Garden at the Montreal Botanical Garden in Montreal, Quebec. The soft white petals of a rose begin to unfold, breaking away from the bud formation in the Rose Garden at the Montreal Botanical Garden in Montreal, Quebec. The glow that emits from the white rose is priceless when the sun appears and highlights the petals as the flower begins to blossom. White Rose - Iceberg Floribunda Rose, Rosaceae, in the Rose Garden at the Montreal Botanical Garden, Jardin Botanique de Montreal, Hochelaga-Maisonneuve, Montreal, Quebec, Canada. Picture of a bud of a white rose welcoming the warm rays of the sunlight at the Montreal Botanical Garden in Quebec, Canada.